Just because I haven't been posting, doesn't mean I haven't been piecing! 1. 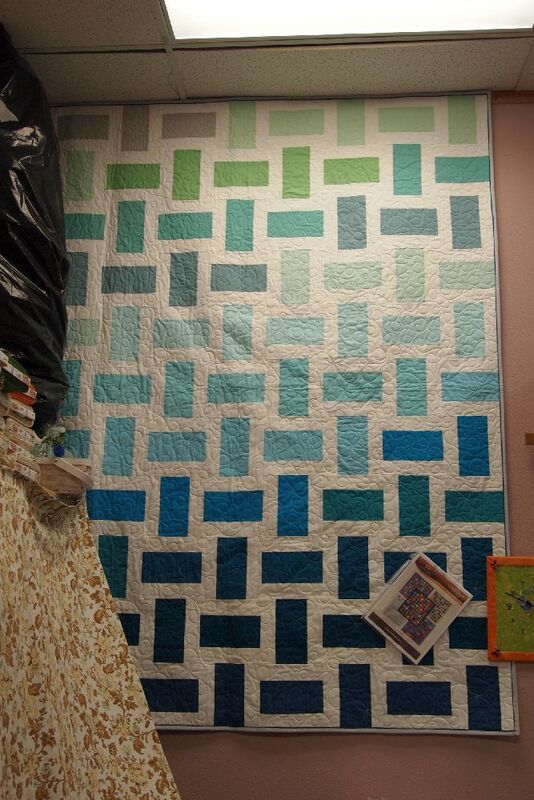 The very first "modern" quilt I made was pieced several years ago. I finally had it quilted by Vivian at Ruth's Stitchery. The fabrics are all Kona cottons. The greens are from a FQ bundle, "Poseidon." The pattern is from Northcott. Sorry I forgot to take a photo before Anne hung the quilt in the shop! The colors are much more intense in person. 2. Robert Kaufman fabrics chose their own "color of the year" for 2016. It's "Highlight," a vivid yellow reminiscent of the first highlighter pens -- remember those? 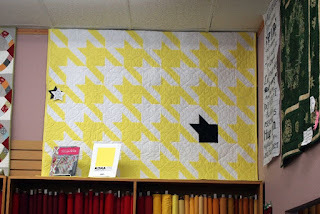 I used Tula Pink's "Houndstooth" pattern from her book, "Quilts from the House of Tula Pink." The single black block is a Hoffman batik called Raven. I call this quilt "Crow in the Wheatfield." 3. The third finish is the sample for the May Jelly Roll Party. 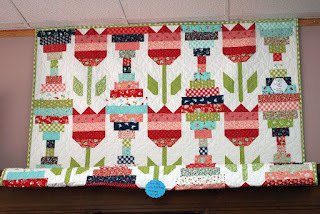 It's called "Vintage Tulips" and I used Bonnie and Camille's "Vintage Picnic" jelly roll, along with a few older Bonnie and Camille fabrics. maybe it will be a "sew day!" Love the colour graduation in the first one...you WERE busy! Love all three quilts, great work. Wow! You have been busy! Such nice colors in these quilts! Hi Aunt Marti, you have such a wonderful blog! 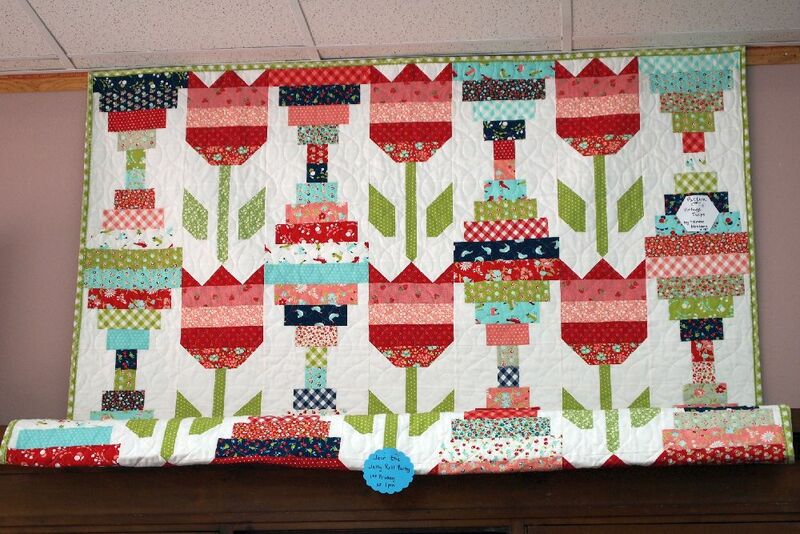 I've gone all the way back to the beginning and have been blown away by your talent and the amazing quilts you make. I especially like this Poseidon quilt. Loved it when I saw it way back in your blog. Can you tell me the name of the pattern? I would love to make one with a pink kona bundle I have. Maybe one with the pool party bundle too :). You have inspired me to finish old projects. I finally finished a quilt I had been dragging on for 3 years! It only needed the binding. And now it is done. I had 3 or 4 unfinished tops on my design wall and I am working my way through them. I have a whole slew of new ones I want to start once I get to the bottom of that design wall :). Thank you for the creative push. You are awesome!